Temple Institute head Rabbi Ariel slams ex-soccer player's addition to Jewish Home list, laments 'factionalism' of religious-Zionist public. Rabbi Yisrael Ariel, director of the Temple Institute, condemned the "factionalism" as her termed it in the religious public as opposed to the unity seen in other sectors, and also criticized Jewish Home's recent Knesset list addition, Israel soccer superstar Eli Ohana. "People don't notice what's happening these days, the Arab parties that united and according to the polls will receive 12 mandates," said the rabbi in an Arutz Sheva interview on Tuesday. 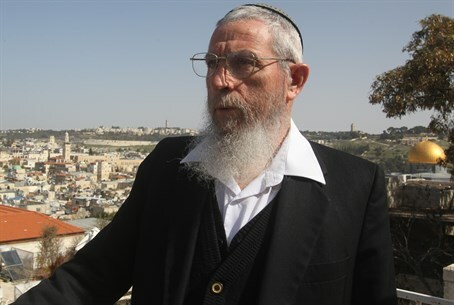 Rabbi Ariel appraised "that means there's no question every shekel entering the settlements will be stopped by the Arab MKs who will be very dominant in the coming Knesset. There's a true danger here that we are all in, and it's shameful that opposed to the Arab unity, there is a sick factionalism in religious Judaism. The right doesn't feel the danger that is lurking at our doorstep." Jewish Home cannot currently represent the religious Zionist Torah world according to the rabbi, who responded sharply to party chairman Naftali Bennett's decision to reserve a seat - likely the number ten spot - for Ohayon. "We've turned into a soccer field, taking anyone - with all due respect to everyone - but they will be our leaders, they will lead (those in the yeshivas) Merkaz Harav, Har Hamor and the hesder (combined IDF service) yeshivas, who will lead us? Soccer players?" posed Rabbi Ariel. Sharpening his criticism, the rabbi said "a Jew who doesn't observe Shabbat and whose values are dictated by his (Knesset) seat - that's not a (political) party, that's a joke." The move has received general criticism given that Ohayon in the past supported the 2005 Disengagement plan, saying in a 2003 interview "(then-Prime Minister Ariel) Sharon can evacuate all the settlements as far as I’m concerned, we have enough land in which to live." Recently Ohayon claimed "I no longer believe in the way of withdrawals." Remarking on the breakdown in talks this week for a joint list between former MK Dr. Michael Ben-Ari's Otzma Yehudit and MK Eli Yishai's Yachad - Ha'am Itanu, in which Otzma Yehudit requested the fourth and sixth seats as opposed to just the sixth, Rabbi Ariel called on Yishai to relent and give Ben-Ari a realistic spot with the fourth spot. "There were attempts to integrate Ben-Ari with Eli Yishai, and instead of doing that while facing the Knesset taking shape, they're going to destroy things. Everyone knows that Eli Yishai isn't succeeding in getting together his public that is still with Shas, there's no content there," he said. "On the other hand, Ben-Ari had 67,000 people that voted for him (in the last elections), he almost got the (needed) two mandates and he already was an MK, he's succeeding in recruiting tens of thousands, so to tell a man like this to be in the sixth or seventh spot is not right," stressed Rabbi Ariel. Emphasizing his point, the rabbi said "a person who brings tens of thousands of people, give him a place inside the first four spots. There is simple egoism and pettiness here, if (Yishai's party) doesn't get back its composure in the last minute and give a place for all the masses waiting for this unity between Eli Yishai and Ben-Ari, it will be a true danger to all of us." The deadline to submit Knesset lists is on Thursday, and Otzma Yehudit has already released its list to be prepared, after talks with Yishai didn't materialize. According to Otzma Yehudit sources, an MK close to Yishai (MK Yoni Chetboun is the only other MK on Ha'am Itanu's list) "torpedoed" the talks by, among other things, saying there was "no room" in the top four spots for Ben-Ari. Polls have shown both parties are likely not to pass the threshold that was raised by the outgoing coalition if running separately, but together would comfortably enter with seven seats.